All transactions are safe and secure with a reliable history in online purchasing behind each of our associates. 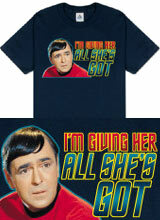 Buy the I'm Giving Her All She's Got t-shirt to own Star Trek clothing and merchandise. "I'm giving her all she's got captain!" Did you read it with a Scottish accent? You should have. This shirt cites one of the most memorable Star Trek quotes spoken by Montgomery "Scotty" Scott. Wearing an original red Star Trek uniform, actor James Doohan's face on this tee clearly expresses his concern, as shown in many classic episodes. Wouldn't you be concerned if you had to tell the captain that there could be danger brewing with the engines? Scotty has been overlooked by many fans, so remind people of his undeniable importance to the crew. Wear it when your Star Trek XI t-shirts are dirty. In addition to the I'm Giving Her All She's Got tee above, browse the Star Trek Clothing Gallery for more apparel like men's and women's clothes, kids shirts or hoodies.